How do I fix update error 0x80070026 in Windows 10, 8.1, 7? Home » Fix » How do I fix update error 0x80070026 in Windows 10, 8.1, 7? Have you encountered the error code 80070026 in Windows 10, 8.1 or Windows 7 while using your Update feature available in the system? Well, I can tell you right from the beginning that there is a very easy method on how to fix error code 80070026 in Windows 10, 8.1, 7 and resume your everyday work. So just follow the steps listed below in the order they are described and you’ll have your operating system up and running in no time. The Windows update error code 80070026 usually appears in Windows 10, 8.1, 7 when you try to install the latest updates. A possible reason as to why you get this error code is the fact that your C:Users folder was changed to another directory, like “F:Users” resulting in potential system errors with the Windows Update feature. In this method we are going to change the “User” directory folder as explained below. Note: Also before attempting the steps below a backup copy of all your important data like files and folders needs to be made. Reboot your Windows 10, 8.1, 7 operating system. When the device starts you will need to log in with your administrator account and password. From the “C:” partition double click or double tap on the “Users” folder. From the Users folder double click to access the “itnota” folder. 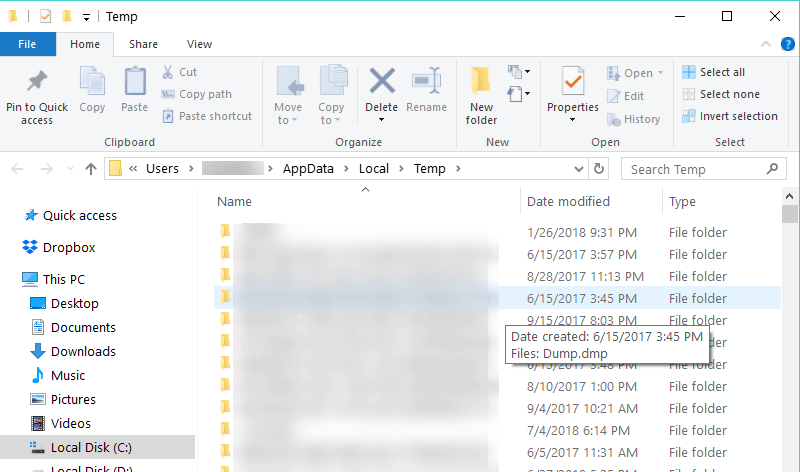 Find and double click to open the “AppData” folder. Now from the “AppData” folder find and double click to open the “Local” folder. Now from Local Folder double click to open the “Temp” folder. Delete all the contents in the “Temp” folder. Note: Before deleting the contents in the “Temp” folder, close all your active applications. Press and hold the “Windows” logo button and the “C” button. Left click or tap on the “Settings” feature presented in the menu that appears. Left click or tap on the “Change PC settings” feature presented in the lower right side of the window. Left click on the “General” tab situated in the left side of the “Change PC settings” window. On the right side panel under “Advanced Startup” left click or tap on the “Restart Now” button. After the reboot process has finished you should get to a window that says “Choose an option”. Left click or tap on the “Troubleshoot” feature presented in the menu. Next left click or tap on the “Advanced options” feature. Next left click or tap on the “Command Prompt” option. You will need to copy the “$$PendingFiles” folder from the SSD drive letter you have or other external hard drive to the Internal HDD. For this example, we will use the command prompt to determine what drive letters you are going to need. In the command prompt window, write the following: “dir C:” and press the Enter button on the keyboard. Do this for all the partitions, you have on the device to determine what partition is from the SSD or external hard drive and which one is from the internal hard drive. Now after you figured out which partitions have the “Users” folder . For example we are going to take partition “G:” as the source (External Hard drive) and partition “H:” as the internal hard drive to which we are going to copy the “$$PendingFiles” folder. In the command prompt window write the following: “robocopy /copyall /mir /xj G:$$PendingFiles H:$$PendingFiles” without the quotes . Write in the command prompt window the following: “mklink /J G:$$PendingFiles C:$$PendingFiles” without the quotes. Write in the command prompt window the following: “Exit” without the quotes. When the device starts you will need to open your Windows Update feature and check again if you still get the error code “80070026”. Note: If some of the steps listed for the second solution are not available on your Windows 10 Computer, skip this solution completely and go to the next one. From the menu that appears you will need to left click or tap on the Search feature. In the search dialog box write the following: “command Prompt” without the quotes. Left click or tap on the “Run as Administrator” feature. If you are prompt by a user account control message left click or tap on the “Yes” button to proceed. Write in the command prompt window the following: “DISM.exe /Online /Cleanup-image /Scanhealth” without the quotes. Write in the command prompt the following: “DISM.exe /Online /Cleanup-image /Restorehealth” without the quotes. Write in the command prompt “Exit” without the quotes. Reboot your operating system once more and try to see if your Windows Update feature is working correctly. Now from the Settings sub menu left click or tap on the “Change PC Settings”. Left click or tap on the “Update and Recovery” option presented in the next window. Left click or tap on the “Recovery” button. On Windows 10, go to Recovery > Reset this PC. Follow the instructions on the screen to finalize the System Refresh and try again your Windows Update feature to see how it goes. If the issue persists and you want to take a short break from any complex troubleshooting solutions, then you can run Windows’ built-in update troubleshooter. This useful tool can help you fix general update issues so that you can finish installing the latest OS updates on your PC. If you’re running Windows 10, go to Settings > Update & Security > Troubleshooter and run the update troubleshooter as shown in the screenshot below. 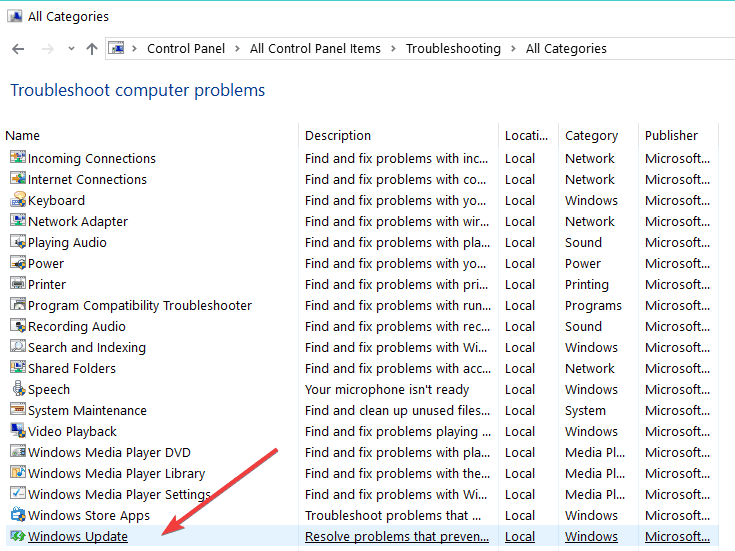 If you’re running Windows 7 or Windows 8.1, you can launch the Update troubleshooter from Control Panel. Open Control Panel > type ‘troubleshoot’ in the search bar > select Troubleshoot > select View All to list all the troubleshooting tools and then locate and run the Update troubleshooter. Quite frequently, your antivirus may prevent you from updating your computer. To check if your antivirus tool is the culprit, temporarily disable it and then hit the ‘Check for updates‘ button. Don’t forget to enable antivirus protection as soon as you’ve managed to install the latest OS updates. 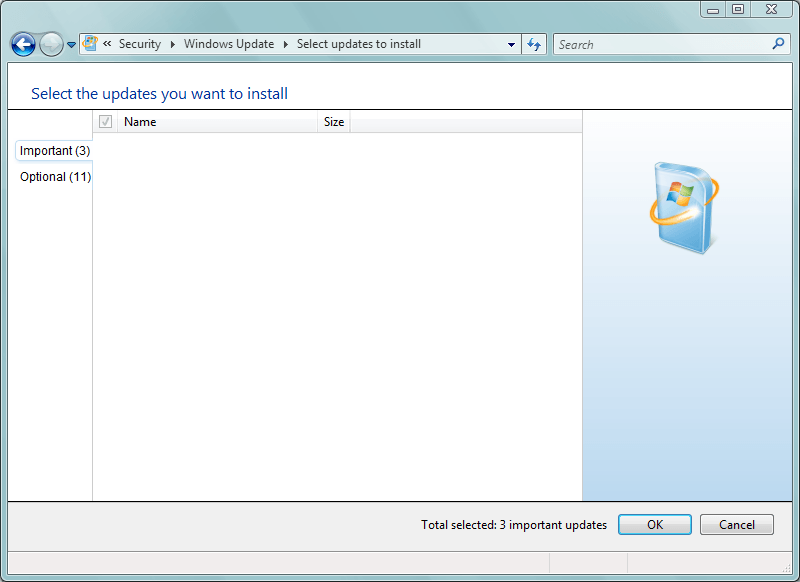 If the Windows Update service is still not working, try to install the problematic updates manually. 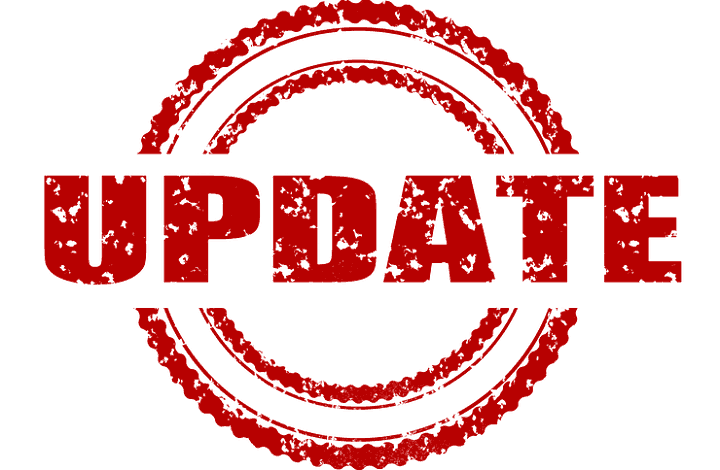 For example, if you’re trying to install the latest hardware driver updates, go to the manufacturer’s website and get the updates from there. If you’re trying to install the latest Windows patches, go to Microsoft’s Update Catalog, enter the KB number of the respective update(s) and hit the download button. And you are done. If you carefully followed the methods above, you now have a working Windows Update feature in Windows 10, 8.1 or Windows 7. If you need further assistance, you can write us in the comments section of the page situated below and we will get back to you as soon as possible.